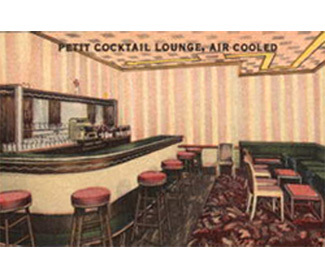 I don't know if the petit lounge was truly small, or was only for drinkers under five feet tall. The Linker was 8 stories tall but quite narrow. Emporis says it was constructed in 1915, and renovated in 1927. This matchbook is not from 1927. The "New" part probably meant paint and new tiles in the bathroon. Well, most of the bathrooms. Okay, okay, the one in the lobby. Not the public one, the one back by the offices.